Now we are going to have a look at Robomow’s flag ship model the RS630. This is a serious robotic lawnmower that can work extremely hard all day long over very large areas of lawn. The features are amazing and cover almost every need you will have from a robot mower. Setting the standard for Robot mowers this is a serious piece of kit that is for very large lawns not the average garden. This is a massive time saver for any large garden owner and will give you hours of you precious time back allowing you to enjoy the lawn rather then cutting it all of the time. Once you have one you won’t want to go back to a conventional mower! It is well worth having a good look at the cutting capacity of the Robomow RS630. It has a huge range of 3,200 metres square which is the equivalent of 0.8 acres. To put into context just how big an area this is the average UK garden is 163 metres square. A full size football pitch is about is around 1.5 acres so a lawn of 0.8 acres is vast. And just remember this is the size of the lawn area not the whole garden, the chances are if you have a lawn this big you will have a much large garden. The wide cutting width is 56cm which is large for a robot lawn mower and is what enables it to cover such large areas of lawn. Most of the smaller models have a lot smaller cutting width which means it is a lot slower to cut. With a wide cutting width like this the lawn will still get cut relativity quickly with no fuss. This cutting capacity means that this is a serious competitor to the ride on tractor mowers and the Robomow RS630 has considerable advantage over the tractor mower. The RS630 can deal with slopes of up to 36 percent which is a pretty steep bank and will smoothly cut the lawn on the slope, it will balance itself out so it doesn’t go flying off down the hill. If you have a hilly lawn it is very important to measure the steepness of the banks to check that they can be dealt with by a robotic lawn mower. The cutting range is vast on this model and you can also break that area down into zones where the lawns are spread around the property. 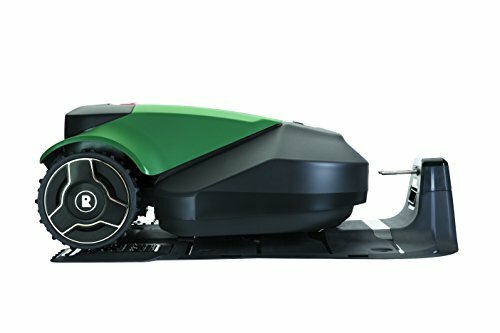 The Robomow robotic lawn mower will trundle between the zones in one cut. You have to make sure these is a good enough path for the mower to actually get between the zones. If your lawns are dotted around a large garden then this is a really nice feature to have. The cut from this model is very impressive and will leave your lawn looking amazing. One major cutting feature that this model offers over many other models is the floating cutting deck. The floating deck means the blade will move with the contours of your lawn giving you an immaculate finish. This is different to the normal fixed cutting decks that will have a height adjust, if you have a bump or dip in the garden the lawn height will altar. The floating deck is a feature usually only associated with high end tractor mowers. The blades are solid tough blades that will give you a clean cut and a nice looking lawn. These need replacing once a year and need minimum maintenance. This really is designed to give your lawn the best finish and a high quality cut. Now we have talked about the all important cut and capacity of the RS630 it is well worth digging into all of the very impressive features that are available on this model. It is a fully loaded model that has all of the features a professional lawn mower needs to maintain a lawn to the highest standard. Have a run through and see if they match up to you requirements. I’m pretty sure they will! The 400 watt motor is a powerful unit that deals well with the huge area this mower can cover. Anything less would not be up to the job. The lithium ferrum battery allows the mower to work for a long time before it needs recharging and has a very good lifespan. Both the charge time and the work time is around 1.5 to 2 hours and the RS630 will charge itself when it needs it even if it is in the middle of a cut. The Robomow RS630 is not much use to thieves unless they have the PIN code that goes with it. This code has to be entered into the unit if it is taken off the charging point or any changes are made to its program. This is a good system as it means there is no real point in stealing the mower and is a great deterrent. The unit is also paired to the base station meaning it needs both and the PIN to work. The rain sensor is a great piece of technology that picks up rain showers and will tell the robot mower to head back to the charge point and wait until the rain has stopped before coming back out to continue the job. This has a couple of big benefits, it will keep the quality of your lawn good as it is not cutting soaking wet grass and it will also stop the robot mower from going through muddy puddles. This is an important feature when it comes to getting the perfect lawn. With pets and children around the home and garden safety is very important. The unit has a PIN lock which means it cannot be operated without the PIN. Once the mower is set up to go you don’t have to worry about people altering it or changing it. If the children and pets are in the garden a lot you could set it to cut the lawn relatively early like 7 am when nobody will be out there. There are also sensors that stop the blade spinning for safety as well. If the robot mower is lifted off the floor the blade will stop immediately and if it tilts too far it will also cut out the blade immediately. The bump sensor will also cut out the blade and change the direction of the RS630 if it hits any object in its path. All in all these are very safe tools if a bit of attention is paid to the set up. The RS630 can be controlled by the Robomow app which is a brilliant bit of technology. You can connect up to the unit to alter the program or you can actually move the robot lawn mower from your screen to cover certain parts of the lawn. This is a feature that is pretty rare on most makes with Robomow being the leader of this technology. It is not a really important feature but it really is a nice to have especially if you are not at home when it is cutting. Value for money on this model depends a lot on how you look at it. If you have a large lawn and have to pay a gardener to come in every week to maintain it then this is a good investment that will earn its money back in no time and will cut the lawn a lot more regularly than once a week. If you have a tractor mower and are thinking of replacing it then this would be comparable in price but with much lower running costs and a massive time saving, so again great value. If you have an average lawn then this is going to be very expensive and a smaller model maybe the right option for you. Robomow have a range that is suited to lawns of all sizes starting with the RC304 for the small to average size lawn. This considerable investment is covered by a three year warranty for peace of mind. You can sit back knowing that if there are any problems you can quickly get them fixed and get the mower working again. But as there are not many moving parts the need for maintenance is low. This is a great robotic lawn mower that can save you hours of monotonous lawn care and give you a beautiful contoured lawn that will always look great. Even though it is a big investment if you have a lawn that is around the capacity for this model you are more then likely spending a lot on maintaining it or it is a mess! Owners swear by these machines and they are a really competitor to the large tractor mowers. Also they are a huge space saver compared to a large mower so you are really gaining a lot by owning one of these. They come very highly recommended and have many very happy customers. If your garden set up is correct for a robotic lawnmower then you should buy one today!